The range of colors and hues in the natural world are amazing, but perhaps even more astonishing is the ability of certain species to actively mimic them. Though the specific mechanisms are as varied as the species, each has a set of color producing cells which can span the visible spectrum. 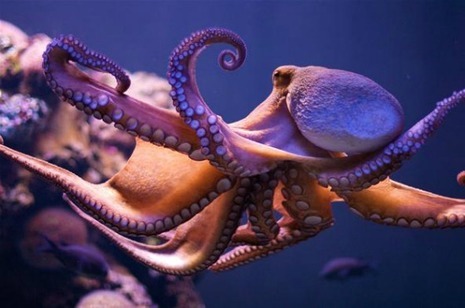 Within this vast set of creatures, cephalopod/octopus stands out as champions, who are adept to cover vast swaths of color within milliseconds. The key aspect of these color displays in nature is generation of color on a thin, flexible and conformally mapped surface – their skin. ​In comparison, manmade displays largely remain rigid, brittle and bulky in nature. 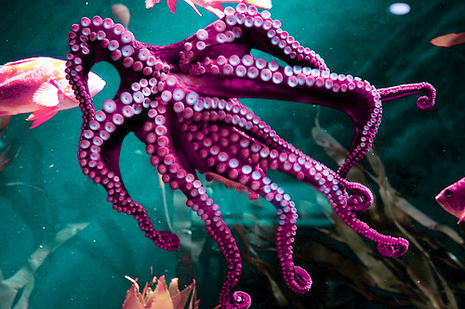 If we look at any widely used present display, it is nothing more than a combination of bright white light and color filters whereas there is no active light source inside octopus or chameleon’s skin, instead they preferentially reflect surrounding light to create color and pattern on their skin using minimal amount of energy. As always Mother Nature chose an evolutionary path of conserving resources. As a post-doctoral fellow at University of Illinois at Urbana-Champaign I (Dr. Chanda) wondered whether creation of a skin-like full-color display was possible. It seemed like a daunting task with many scientific and technological challenges. Various attempted strategies like mechanical stretching of color filled capsules embedded in polymer matrix, size variation of metal nanoparticles, tunable diffraction gratings and microfluidic expansion/contraction of colored liquids produced limited results. ​"Upon completion of my post-doctoral fellowship, I joined University of Central Florida as an assistant professor but never forgot the grand challenge of color creation on skin-like surfaces. I began building a new research group, of which, Daniel Franklin joined as an inaugural member. After numerous brainstorming and rigorous electromagnetic simulations we eventually designed a flexible, plasmonic surface with tunable response which spans the whole visible spectrum for the first time. Daniel played a significant role as his persistence, tenacity and creative thinking helped us overcome various scientific and technological barriers"
Now we wish to bring these results from the lab to the world through ‘e-Skin Displays Inc.
nature-like color and pattern generation.